Virtual Clinic is a add-on workflow optimized for Walk-in Clinic is a type of Virtual Clinic add-on that allows new visitors to sign up to request sessions of a designated group of users in a coordinated way. You will need to be logged in as an Account Administrator to make the following change. 1. 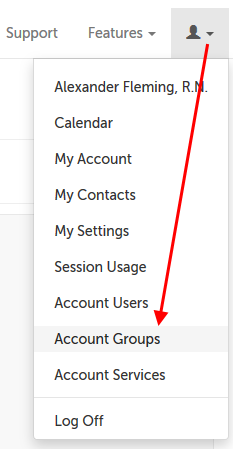 Click on the profile icon in the upper right-hand corner and select "Account Groups" from the drop-down menu. 2. Click on the "Enable Public URL" button for the "Virtual Clinic Participants" group that you want to allow public users for. 3. Copy the Public URL that appears. Use this link to send public users to a registration form. Once they complete registering as a user, they can make requests into an existing Virtual Clinic queue. This article was last reviewed by our Support Team on May 9, 2017.